Food Costs > How Much Does Cornstarch Cost? How Much Does Cornstarch Cost? Cornstarch is the starch that comes from the corn grain or wheat. It is often used as a thickening agent and used to make corn syrup and other sugars. Most people prefer to use cornstarch as a thickening agent since it doesn’t dissolve clearly and won’t alter the color or the appearance of dishes. At most grocery stores or online stores, you should expect to pay anywhere from $0.30 to $0.50 per pound if buying in bulk or about $0.75 to $1.50 per 16-ounce package, which is often the package size you will find at your local grocery store. An organic/non-GMO cornstarch can cost closer to $3 for a six to eight-ounce box. The price for cornstarch depends on the brand and the quantity. At Walmart, for example, a 16-ounce pack of its Great Value-branded cornstarch retails for about $1.15, whereas another brand, Clabber Girl, retails for a pinch less than $1 for a 6.5-ounce container. A bulk purchase, when commonly purchased by a restaurant, for example, the costs can be about $15 to $20 per 50-pound bag. Generall, the more bags you purchase at once, the more you can save. At the WebstaurantStore, for instance, one bag can retail for about $18 per bag; however, if you were to purchase more than 50 bags, then the price would drop about $3. On Amazon.com, most of its best sellers cost anywhere from $3 for a one-pound package to $3 for a 35-ounce container. 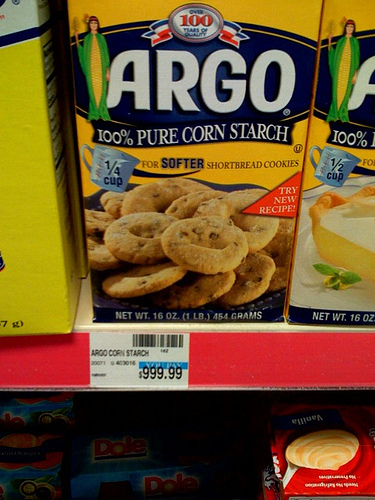 Popular brands include Argo and Clabber Girl, and cornstarch can commonly be found in the grocery store’s baking goods aisle. Cornstarch is flavorless and it used as a thickening agent in a variety of recipes, including sauces, gravy, pudding and desserts. In order for it to lose its starchy taste, however, it must be heated and cooked for a short period. Heating it can also bring out its thickening properties, creating the right consistency for your dish. Aside from being used as a thickener, it can also be used as an anti-caking agent when it’s mixed with powdered sugar. One cup of cornstarch has 488 calories, 117 grams of carbohydrates and 0.3 grams of protein. Cornstarch is has proved to be an effective home remedy over the years since it can provide temporary relief for anything from chicken pox to poison ivy. One of the most interesting properties of cornstarch often demonstrated in the classroom experiments, is that it becomes a type of non-Newtonian fluid known as dilatants when mixed with water. Cornstarch is also used by powdered sugar manufacturers as one of the ingredients to prevent the sugar from clumping. Some people prefer cornstarch-based baby powder to the more traditional talc-based variety, as talc may present health concerns. Aside from being a thickening agent, cornstarch can help prevent eggs from curdling, which helps when making custard, flan, cheesecake and quiche. To store, it’s critical it’s stored in an airtight container, where it won’t be exposed to humidity. Always store in a cool, dry place. Does cornstarch go bad? As long as it’s kept in a cool place, it really can remain safe indefinitely. Gluten is not present in corn starch, which makes it a great substitute for flour in many recipes that call for it. Stored branded cornstarch will almost always be 20 to 30 percent than the name brands. Name branded cornstarch often have coupons available online via their social media channels or even in the local newspaper.